I have planted an extremely large area of dill and weeds are plentiful. How can I rid them from the dill other than hoeing them out? Are there any chemicals on the market? Other than hoeing or hand pulling, there is little else you can do, though careful spot treatment with boiling water or vinegar can help. 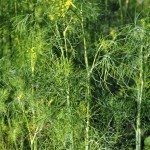 Keep in mind that this will also kill the dill should any happen to get on the plants.